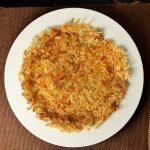 Step-by-step guidance explaining how to make homemade shredded hash browns from scratch perfectly every time. Do you ever discover yourself cooking a bag of frozen hash browns and find yourself thinking, “You know, these are good and super easy to make… hmmm, almost too easy!” Would your life be better if making breakfast was a little more time consuming, required more energy, and ran a much higher risk of utter failure? If so, keep reading! If not, check out my easy hash brown casserole instead! Like the college student that all of a sudden discovers he can drink beer, I went slightly overboard making homemade shredded hash browns. Eating frozen hash browns wasn’t good enough for me; I needed to know how to make them from scratch and how to do so perfectly. So for about a year, I made them multiple times a week until I could fully understand each facet of the process. Why did some recipes call for soaking the potatoes and others rinsing them? Is changing the water or using ice cubes really necessary? I don’t like blindly following recipes. I want to know why I am doing something so I can figure out for myself if there is a better way. First thing I learned: Peel the potato only if desired. This will not affect the final dish. Some like the rustic look of potato skins in their food, others do not. Pick a side. Then shred the potato and then quickly move onto the next step to prevent oxidation. Second thing I learned: Some recipes call for soaking the potato in ice water, while others just say to rinse the shreds. What you are actually doing here is removing the excess starch from the shreds so you get a crisper final product. Cold water prevents oxidation and if you decide to soak the potatoes changing the water will remove more starch and speed the process. Personally, I prefer to rinse the shreds in a strainer under the faucet until the water runs clear because it is easier to tell when the objective has been accomplished. When the water runs clear I know the starch has been removed. Third thing I learned: The stored water must be removed from the potato shreds and there are multiple ways to accomplish this. Personally, I like to just grab a fist full and squeeze it over the sink. However, if you are cooking for others you may want to ring it tightly in cheese cloth or just squeeze out the liquid in a ricer. Whatever method you choose, be sure to work in batches so the water can easily disperse. The more water that is removed, the crisper the hash brown will be. Once water has been drained, mix in salt and pepper. Fourth thing I learned: Heat a nonstick pan (This pan has been my main workhorse for years and I would buy it again in a second) with a mixture of oil and butter on medium high. Butter gives hash browns better flavor, but adding oil prevents the butter from burning by raising its smoke point. The fat mixture lies more thinly in the pan and also coats it more evenly which allows for more even contact with the hash. The above link is an affiliate link. Any purchases made through that link help support FoxValleyFoodie.com at no additional cost to you. Fifth thing I learned: Place the hash in the hot pan and press with a spatula to evenly flatten the potato shreds. Thinner is better as this will ensure everything cooks. If you desire healthier hash browns you can use a minimal amount of oil/butter, but more fat will result in crispier hash browns. Sixth thing I learned: Once the bottom is crispy you can use a spatula to divide the hash brown into four sections and then proceed to gingerly flip them. OR you can man up and flip the whole thing in the pan with a quick upward flick of your wrist… don’t worry your dog will love you as you practice. Once flipped proceed to cook until the bottom is crisp. 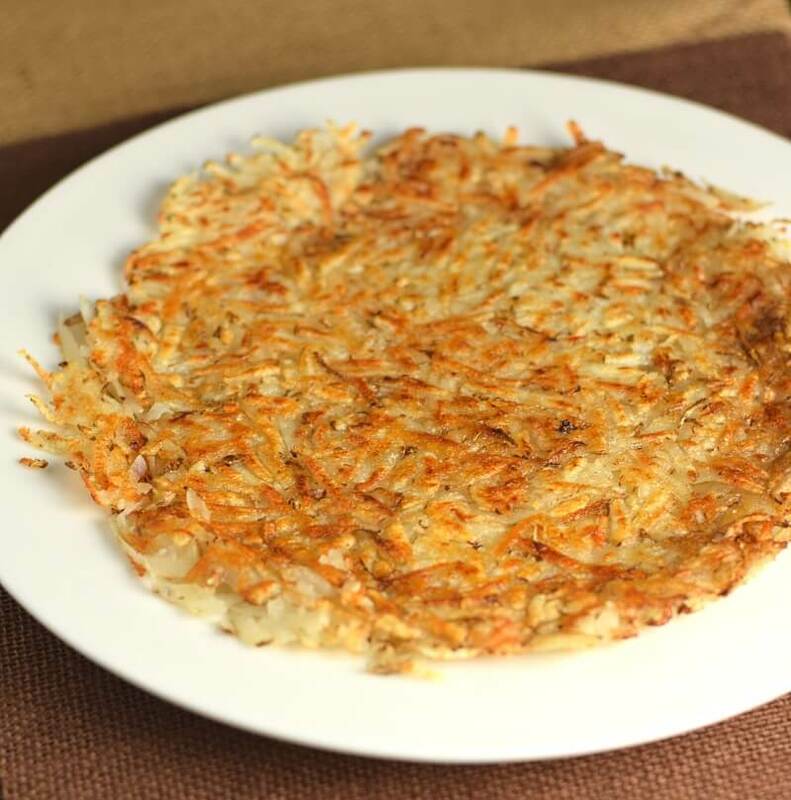 Once you have finished cooking your homemade shredded hash browns you can serve them immediately or place in a warm oven to keep them warm while you work on additional batches. You can shred the potatoes and leave them soaking in water for a few hours until you are ready to cook. This will remove the excess starch and prevent oxidation until you are ready to cook. I never had good results with par-cooking the hash. Blanching the potato shreds did prevent oxidation but the hash browns never stayed together when cooked and the flavor was off. I doubt that I just spared any of you from a year-long sabbatical to fully understand the inner workings of the perfect shredded hash brown. However, if I have perhaps given one person a sense of personal satisfaction for not only following my recipe but actually understanding what they are doing and why… then I am just as happy. If you need a breakfast suggestion to pair this with, I highly recommend my English Muffin breakfast pizzas. Check out the recipe, I think you will love it! Melted cheese, fluffy scrambled eggs, sawmill gravy, and sausage, all atop a crispy English muffin! What’s not to love? 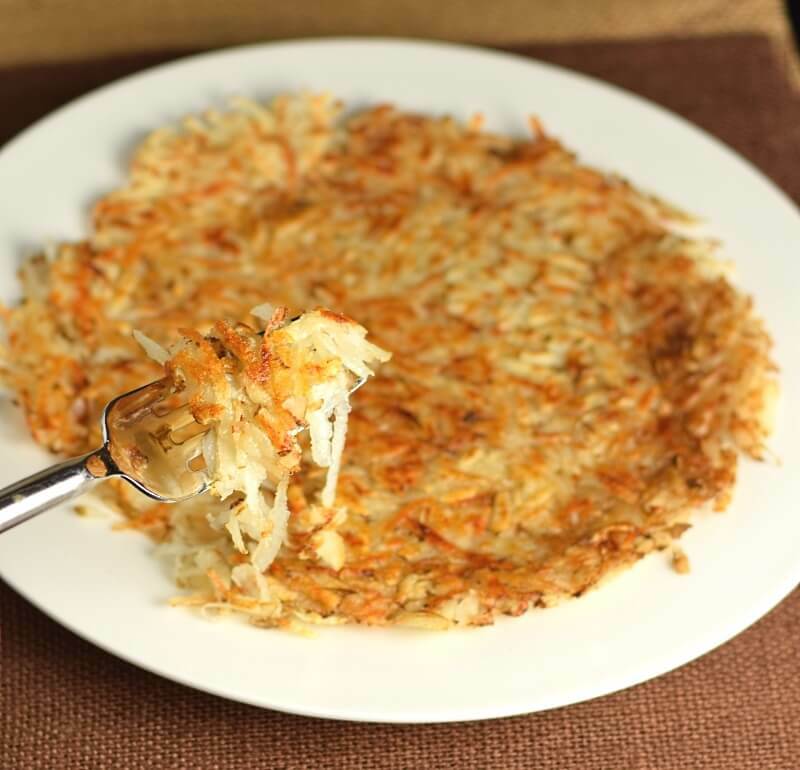 Deliciously crispy homemade shredded hash browns made from scratch! Drain the water and wrap clumps of shredded potato in cheesecloth or ricer and squeeze tightly to remove all moisture. Melt butter in non-skillet with oil. Place hash in hot pan on medium-high heat and press with spatula to flatten into a uniform thickness around pan. Once bottom is crispy divide into four sections and flip (or keep it whole if you are able to flip it), continue cooking until it has the desired crispness. 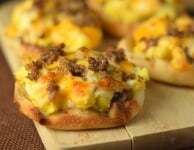 IF YOU LIKE THIS RECIPE you will love my English Muffin Breakfast Pizzas too! This recipe was originally published on FoxValleyFoodie.com June 3rd, 2012. If you enjoyed my Homemade Hash Browns from Scratch recipe then you should probably like me on Facebook and follow me on Pinterest too. That’s what I would do at least, because if you don’t get to know me but you still use my recipe it is kind of like taking candy from a stranger, and your mom taught you not to do that. Don’t disobey your mom, subscribe to Fox Valley Foodie today. I just made hash browns the way you recommended and they were great! I just added cheese and made them yummier! Thanks for the advice. You succeeded in giving one person satisfaction in making better hash browns. You taught me too! I just tried out my new cuisinart griller and decided to make eggs & homemade hashbrowns. I just shredded, seasond & cooked. It was a super-gross, brownish, sticky mess. I had to get online and see what to do right away. I have another potato shredded, rinsed & soaking for when my hubby wakes up. He won’t even know I’m not a hashbrown expert! So happy you posted your potato experience! I’m preparing grated potatoes for tomorrow – grated potatoes with white cheddar and bread crumbs – most amazing cheesy potatoes on the planet. But as soon as they started turning pink I got worried about them! Googled some nonsense about potatoes and found your amazing post! THANK you! I’ve also boiled them and cooled them, this makes them firm and cold when they hit the oil. So start the oil. peel and shred the potato and cook immediately. Just tired them your way and took out the water never quite understood why my boiled potatoes always came out crisper and your way is much better than mine. Your commitment to making the perfect hash, sir, is commendable! I salute the techniques you’ve described, and I have been, over the past several days, indulging myself completely! I now fear I may have a problem, since I can produce the perfect hash at will! I laud your efforts. I get obsessed as well, most recently w/ cheesecake. I use my neighbors as test subjects. On to the hash browns. This is absolutely the best way to make them. There is a step to be saved however if you are making them immediately. The rinsing is unnecessary. I shred them w/ my box grater, give them a vigorous squeeze(removing as much water as possible is imperative), and get them into a hot pan. I flatten them w/ spatula after seasoning w/ salt and pepper, a little garlic and red pepper flakes. This flattening of them really does aid in the crispiness. These are so crispy when done I cut them w/ a pizza cutter. Absolutely fabulous! THANK YOU, THANK YOU, THANK YOU!!! I’ve always hated that my homemade hash browns turned a yucky grey when I put them in the pan. Now I understand the process and I’m gonna go make some. Just followed your recipe and my hash browns turned out PERFECT! It was my first time ever cooking hash browns. Thank you so much for sharing. Can’t wait to make them for friends. Had them with pan fried flat iron steaks and eggs….ummm! J.S. Thank you so much for this, it actually works! No more gummy/sticky hash browns for me ever again. Been making the potato pancakes, cause I never could get those hash brown correct. You just saved my Sunday morning breakfast. Thank you! I have the same reaction to my cooking. I want to know how/why something affects the taste of the food I am cooking, especially if it’s delicious. Last night I sauteed onions, cabbage and bowtie pasta (and then cooked in small amount of chicken stock) seperately and then combined at the end. ( I may add shredded carrots next time. It’s an Eastern European dish. The recipes I found just asked for one to sautee onion and cabbage which I did. I’ve sauteed (carefully) the dry pasta before for different dishes. It adds a nice ‘brownness’. We like things spicey so I may add a spash of sriracha too. Wish I had this information over the weekend. Tried a recipe and what a flop it was. Talk about oxidation, starch and excess liquid. Anyhow, thanks. I’ll look forward to trying them again. Good advise. I love making weekend breakfast for the family, but always use frozed HB’s execpt once. The first time I made homemade hashbrowns I thought it was just peeled potatoes. I didn’t rinse them. I didn’t remove any water. I just shredded potatoes and threw them in a pan with oil …I pretty much ruined that pan. Thanks again, and I’m off to the kitched. I’m going to try making these now. But i have lots of potatoes that i got on sale and want to make up and freeze. Any sugguestions? Would you peel, shred, wash, dry and then freeze and store? Or do you recommend cooking up the hasbrowns and then freezing them? I am almost 66 years old, and have never, EVER been able to prepare hash browns that turned out anything other than a gloppy, sticky, greasy mess (shame!). For some reason, this morning I got it in my head that I WAS going to find out how to make perfect, crispy hash browns. I would not want to die without having this knowledge! As my husband and I both appreciate perfectly prepared potatoes for breakfast, I naturally went on Google. Yours was the first ~ and ONLY ~ link I clicked on, much to my extreme pleasure! I’m relatively certain that the step I routinely skipped was to rinse the taters once shredded, for that made all the difference in the world. So, I shredded, rinsed well, blotted in paper towels, and poured them into the pan which was waiting with your recommended mix of butter and oil. Rather than further elaborate on my elation here, I will just send you a huge THANK YOU!! for your post here. I’ll be making many, many batches of hash browns in the future, and will always say a silent “thank you” to you! I’m not on my death-bed by any means, but now, when the time comes, I can die 100% happy!!! THANK YOU, THANK YOU, THANK YOU!!! Ellen, I’m coming up on 71 and have never had decent hash browns. Frozen were almost as bad. This works FANTASTICALLY! Likewise, I never “Cured” my fry pans. What a difference that makes. And, they ask, “Going to buy an new knife set, Don’t…”. I splurged and bought four and a steel. All I will ever use… This ole Dog learned a new trick! Nice! I do all sorts of things to my potatoes and this helped with the rinsing the strach part, thank you! My question is: Can I freeze them after cooking? I don’t use many potatoes (widow) but buy the bag as its less expensive. I have never tried freezing them, so I am not sure but now I am curious. If you try it please let me know how it turns out. I would suspect it would turn out ok, though I would probably reheat them in the oven rather than the microwave (but then again I hate reheating most things in the microwave). Most of the previous comments were filled with things I had intended to say, but i didn’t want to repeat any of those. The only thing I WILL repeat is a heartfelt THANK YOU. Did you use an infrared heat gun to measure or find the desired skillet temperature? Any advice for using clarified butter to raise the cooking temperature? How long does each side typically take to cook? We love the IHOP version of hash browns, although other places like the Waffle House elect to make the crispy version. While we love crispy hash browns, they are higher in oil than IHOP’s style. 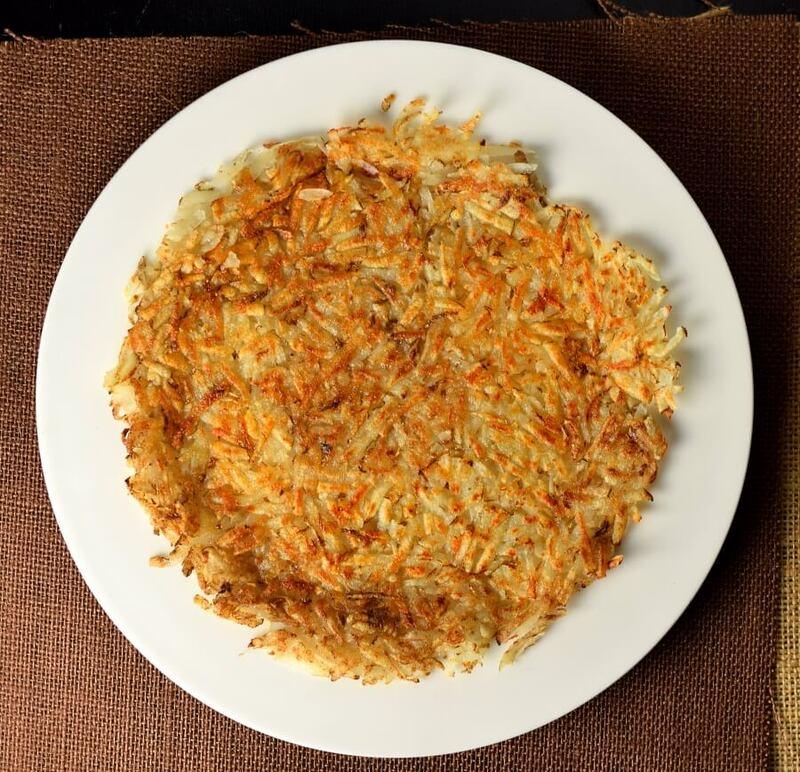 Any advice on making the non-crispy hash browns like IHOP…assuming you have tried that version? Instead of running water, we used the Asian rice technique. Fill a bowl with water, stir by hand then drain and repeat until excess starch is removed; the critical step in making non-mushy hash browns (as you recommend). Did you try Alton Brown’s technique for opening holes on a box grater…to make the shreds thicker? I ask technical questions only because you appear serious and dedicated a year to developing your techniques? Thanks for the recipe! Just made some for breakfast and they turned out perfectly! I am going to try this! Thank-you for explaining the “why” because my first personal attempt this morning at what I thought was a really good idea turned into a grey gluey mess!! So I had to get on the internet and figure out what I did wrong 🙂 Btw your blog is great! Love your humour! I consider myself a decent cook, but I have been wondering for years why my hashed browns never turned out. Now I know why! I was determined to make a great breakfast for my husband for Father’s Day, and found your advice. I’ve made them according to your recipe several times and they haven’t failed since. Thanks so much! Looks yum me and my dad make these for the family we served them with bacon eggs mushrooms and cheese they are fantastic I love the recipe . This is exactly what I discovered. Excellent advise! This worked great for me. Thanks. I will add something no one else has mentioned. If you want to get out the moisture after squeezing them over a strainer I suggest putting them in the microwave on high for 5 minutes. I thought they might lose some flavour or mess with texture (as microwaving often does) but it doesn’t. PERFECT and DELICIOUS ! Thank you for the great advice to creating the best homemade hash browns ever! Making hash browns has always been a challenge. If I tried to do them from scratch, they were gluey, grey and slimy. I had been using freeze-dried or frozen to avoid spending the time to figure this out. I read your article and went to work. What a difference, but I am still working on it. I had good success with a ceramic pan, but forgot to squeeze out the excess water. For those of us who do not have the typical family or four this is an amazing way to be able to cook exactly what you want. You should be very proud of your efforts. Thanks so much for the article. It was, not only useful, but also fun to read. Just did your recipe… it was very good. Thank you. I love cooking breakfast and never seemed to quite get these right, until now. It was amazing to see how much starchy water came out on squeezing. I think next time I will reserve the water, and let the water evaporate to get the potato starch. I have a gravy idea that I want to try out. Thank you for your time in posting this recipe. Excellent! Far superior to the crappy fare served at “family” restaurants across America. A note on oils: you should never use olive oil or any of the toxic industrial seed oils like canola for frying. A high smoke point oil is key. The number one best fat would be Leaf Lard if you can find it. Never use frankenfood hydrogenated lard which is full of dangerous trans-fats! Other excellent choices would be bacon fat as the author suggested or coconut oil and ghee (clarified butter). I use an inverted plate, of a size just smaller than the pan, to hold the hash browns while I flip the fry pan. I then slide the potatoes back onto the pan to finish browning. There is much less chance of potatoes falling to the floor or the browns from flopping onto themselves. Otherwise, great recipe! I was going to suggest the inverted plate method, too, but Ed beat me to it. I will add this: before you heat the frying pan, find the plate that’s not your fine china, and is big enough to cover to the edges. Try the flip cold with nothing in the pan, so you get the feel for what’s going to happen when it’s smokin’ hot. When you finish side one of your cook, plop the plate over the browns, hold the plate down, and carefully turn the pan upside down so the browns now sit on the plate. Lift the pan off, back to the fire, and then I add a bit more oil/butter before sliding the browns back in, cooked side up. Works beautifully! And be careful not to burn your wrist as you do this flip! Wear a mitt if you’re prone to wobbliness! I shredded some potatoes in my food processor on Sunday to make hashbrowns for the first time. I immediately put them in the skillet and ended up with a waxy ugly mess! I didn’t know what I did wrong but now I totally get it! Thank you! Thanks for the info. It helped me a lot. My hashbrowns were grey, gooey and yucky. Now they are white, crisp and delicious! well here I go, one big breath and I’m heading for the kitchen. thanks! you sir are a gentleman and a scholar. damn good hash browns were made from this recipe, eternal and heartfelt thanks. Oh . my . gosh !! These were so delicious, light & fluffy. A wonderful complement to our breakfast before we head out to shovel a foot of snow! Thank you for the back-story & the significance of rinsing the starch out of the grated potatoes & then squeezing the excess moisture out as well. Good info to have. Thanks for a great recipe! My previous attempts were dismal. I did an internet search and found this recipe. This worked perfectly and I was amazed at the amount of shredded hash browns one potato will make. I added a few herbs, shredded some parmesan reggiano on the finished potatoes and substituted coarse sea salt for salt. What about using a par-baked potato? You mention that the flavor is off when using par-cooked shreds, but I’ve had moderate success baking a potato for 30 minutes the night before, letting it cool and then shredding it. My main problem in attempting homemade hash browns has been that they just won’t cook. I wait 30-45 minutes for the shreds to stop being raw/crunchy, adding more oil and butter than I can justify, and then either declaring them “done” or eating semi-crispy hash browns that weren’t worth the wait. I’ve tried putting the lid on the skillet so they will steam themselves, and even though the outsides browned the inside was mushy and rubbery. I hadn’t heard of removing the starch and excess water, so maybe in addition to pre-cooking the potato (and letting it cool; otherwise it goes to mush in the food processor) I can use this method to have crispy hash browns without so much fat. That’s not letting the oil heat enough. I had that problem. America’s Test Kitchen mentioned letting the oil heat until you see wisps, then put the potato in. Genius! I remember and learn Always when I am told “why?”! Never understood the blandness because of no butter added to the oil! All the times I have not made a recipe because I didn’t have hashbrowns ! I tried this method using a Yukon Gold potato, and the shreds remained separate throughout the cooking process rather than forming patties. I followed the instructions to rinse and dry the shreds, but after a few attempts to divide and “flip” them during cooking, I ended up merely stirring them every few minutes to ensure that they all cooked evenly. The result was good – probably my best hash browns to date – but I wonder if this was the result of a Yukon being more or less starchy than a russet – ? did you ever find out if you can freeze the uncook hash browns? I never had success freezing them. The shreds don’t seem to hold together anymore. I have two football playing sons and they love hash browns! Can I peel the potatoes, shred and rinse and then store them before using? I would like to peel 10lbs and have them ready for the week. Please let me know! Bagged browns are getting too expensive! I have not discovered an effective way to store them in advance. Trying this for breakfast today! My husband paid this recipe the ultimate complement. He said these hash browns are better than the ones from Waffle House. Thank you for posting this- we live overseas and were really missing some good comfort food. I have tried all of the steps in the treatise and still did not obtain a satisfactory result. However, the drier the potato shreds, the better the result. I tried ricer and hand squeeze method, but these ruined the shred quality. Paper towels took mountains of paper towels for a good result. Thus, I have gone to the previously baked potato method. Bake the potato the night before, shred the next morning and fry as described in your treatise to obtain a better hash brown. Almost IHOP standard of hash brown except not as likely to be burned. Thanks for your comment. Out of curiousity, what was the issue with the results you acheived by following the instructions listed in the post? Thank you for your post. You are right…it is a lot easier to do things when you know the reasons why…for that I Thank you again!!! Tomorrow morning these beauties shall be on my table. Yay! This is a very helpful and informative post, thank you! I’m planning to make a hasbrown casserole for Easter morning and was wondering if I could prepare these hasbrowns the way you described and use them in my casserole without them becoming mushy and gross. I usually use frozen, but would much prefer fresh! I tried doing exactly that for my hash brown casserole (http://www.foxvalleyfoodie.com/easy-cheesy-hash-brown-casserole-recipe/) and did not have success with it. The hashbrown shreds didn’t sufficiently soften in the casserole no matter how long I baked it, it seemed. If I would attempt it again I would probably boil the shreds to soften them prior to adding them into the casserole. Great, thank you for the link and the response! Haha, thanks! I’d be lying if I said I didn’t enjoy swapping out for bacon fat on occasion! Good grief what a delight. I’m an expat Brit. and we love our fried foods (look up full English breakfast), yes we even fry bread! Hash browns were an immediate favourite of mine and, well, this is the bomb! Of course I doctored it up by adding garlic/onion before I flipped it, dropped an egg on top, waited until the bottom was brown, topped with grated cheese, then under the grill until the cheese was brown. Clean up (give the egg time to cook through) and enjoy. Thank you Sir. Great minds think alike! I also love doctoring it up on occasion with a ‘healthy’ helping of grated cheese, and top it all off with an over-easy egg or two! Bon appétit my friend! When do I use the butter in this recipe? The oil and butter go into the skillet together. Correct, just the magic of potatoes! Thank you so much!! I tried making hash browns from scratch yesterday and it was a DISASTER!!! Now I can’t wait to try again. Me. Literally me. It made me so happy to read that and finally understand WHY what I’ve been doing has been wrong. So sincerely, thank you! Best comment of the day. Thanks for that! For not just saying do this and this without reason.